ADDITIONAL INPUTS: Dewesoft power analyzer system can also measure different signals like IEPE; thermocouples, digital, counter, GPS, CAN, XCP, FlexRay, video, etc. All inputs are fully synchronized. considering also other loads (heating, air-conditioning, 24V, 12V, etc.). The high sampling rate and bandwidth of the Dewesoft power analyzer enable the measurement of wireless in-wheel motors. And thanks to the small physical size of the hardware, you can even use it to measure the efficiency of electric motorcycles and electric two-wheelers under real driving conditions. The Dewesoft Combustion Analyzer module allows detailed analysis of the combustion process. The analysis is perfectly synchronized to the power analysis and this gives you the flexibility to test and analyze the entire vehicle with a single DAQ system. CA module can display and compare measurement data using several different diagrams like the pV-diagram (pressure of angle) or the CA-Scope (pressure over angle). All the specific calculations like the mean effective pressure (IMEP, PMEP), heat release, start/ end of combustion (SOC, EOC), start/end of injection (SOI, EOI), indicated power, maximum pressure (Pmax), derivate pressure (dp/da) are presented either as colour diagrams or as a data tables. For more detailed analysis, statistical calculations per cylinder or over the complete engine can be performed. Additionally, we provide a dedicated knocking detection and combustion noise algorithm. The basis for all of these calculations is precise angle position data and cylinder pressure measurement. Dewesoft provides the perfect hardware for this task. The galvanically isolated SIRIUS charge inputs (with up to 24-bit resolution and 160 dB dynamic range) which are in perfect sync to the Dewesoft Supercounter inputs. 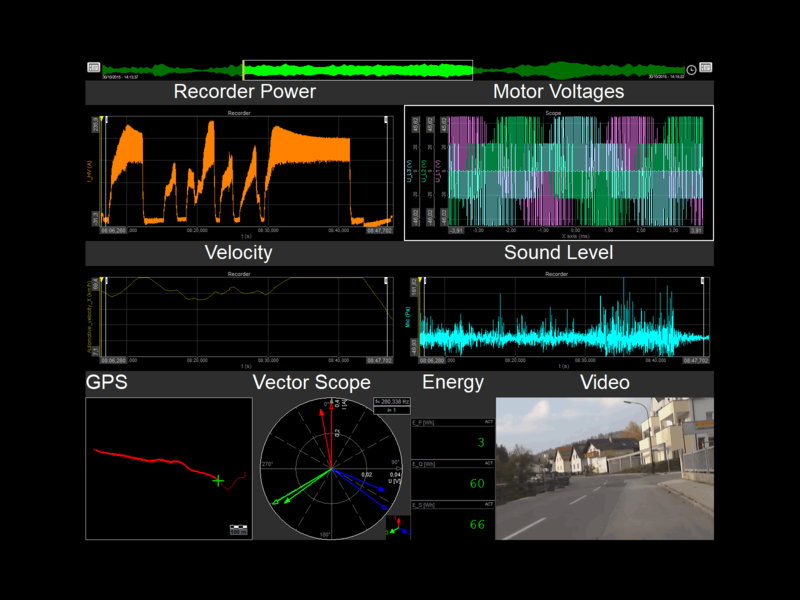 This solution offers perfect analysis of hybrid cars on the road or in the testbed. The drivetrain of hydrogen cars differs from pure electric vehicles due to the energy storage. While pure electric vehicle uses a battery as energy storage, the hydrogen-powered vehicle uses hydrogen as energy storage which is converted to electric power via a fuel cell. The drivetrain also includes a so-called supercapacitor which stores power for short time peak loads (up to 2000A) and a battery pack. Testing of hydrogen cars affords a couple of AC and DC power measurements (see picture). To determine the efficiency of hydrogen cars, we need additional measurements, like voltage, current, and hydrogen flow. The battery as the central element in the electrical powertrain strongly affects performance and range of electric vehicles. 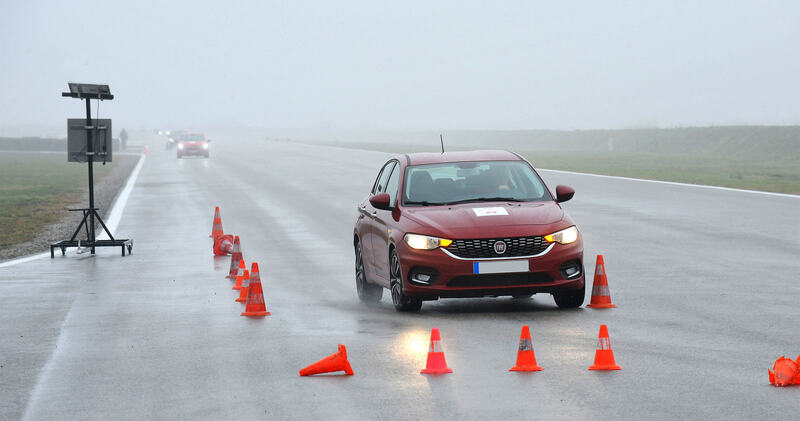 Extensive tests are necessary, starting from the cell characteristics up to the complete powertrain. Detailed analysis requires temperature and voltage measurement at multiple points (e.g. 50x cell voltage and 50x cell temperature). The flexible and scalable Dewesoft solution allows measuring more than 1000 channels from different sensors, all perfectly synchronized. The DEWESoft® Power Analyzer system can be used for the development of batteries (efficiency analysis, cell characterization, endurance tests, crash tests, short-circuit analysis, overheating/overloading tests, aging tests, etc.) as well as for monitoring applications (data logging, transient recording, charge-discharge analysis, etc.). Charging analysis can be done for conductive charging (AC or DC) and as well for the increasingly popular inductive charging. The inductive charging process (also called wireless power transfer) affords high switching frequencies of the inverter (up to 150 kHz) to reach the maximal efficiency of the power transfer. The high sampling rate (1 MS/s) and the possibility to measure AC and DC currents of the Dewesoft Power Analyzer fulfill all requirements for testing both, conductive and inductive charging. The innovative solution of DEWESoft® allows measuring the energy consumption of electric vehicles on the test bench as well as inside the vehicle under real-driving conditions with the same measurement device. For the mobile application, the measurement device can be powered by hot-swappable battery packs so that measurements up to several hours are possible. All sensors (current transducers, GPS, Video) and further equipment like displays can be powered from the measurement device itself. Also, the zero-flux transducer which need a lot of power (up to 20 watts per unit) can be powered via the additional MCTS power slice. The testbench applications require several interfaces (CAN, OPC, DCOM, etc.) to get data and send the data from the testbench control. The Dewesoft X NET option provides remote-control features for the Dewesoft DAQ systems. This allows controlling the whole test procedure from a single PC in the control room. The modular hardware design of Dewesoft Power Analyzer offers a wide range of input amplifiers. In combination with the flexible software makes it possible to acquire a lot of additional parameters: e.g. torque, speed, temperature, pressure, flow rate, video, GPS data (position, acceleration, speed), vehicle bus data (e.g. CAN, OBDII, XCP, FlexRay), and many more. All these additional data sources are synchronized to the power analysis signals, even when they use different sampling rates. This unique combination of time-, angle- and frequency-domain data acquisition in one system makes it possible to run multiple analysis functions concurrently: e.g. order tracking, torsional vibration, power, combustion analysis and many others. Standardised driving cycles (NEFZ, WMTC, etc.) are not suitable to measure the energy consumption of electric vehicles. They don’t consider all aspects which influence the energy consumption of vehicles and are always done on roller test benches. The future of electric vehicle testing is analyzing them under real-life conditions. The innovative solution of Dewesoft allows doing all analysis already during the measurement. The sophisticated math functions can calculate different parameters like efficiency, recuperation, etc. and the user-friendly and customizable software interface allows real-time visualization of all these parameters. The chart shows the exemplary energy flow of an electric vehicle. Some inverters of electric vehicles (e.g. bus) are working at different switching frequencies to increase the efficiency in different driving situations (city/overland drive). With the Dewesoft math library, it is possible to filter out the currently used switching frequency and automatically do the analysis for different switching frequencies (using logical conditions). There are a lot of parameters which can influence the energy consumption of electric vehicles. These parameters can be ambient parameters like temperature, weather, quality of the road or different driving situations (uphill, downhill, city, overland or combined drives) or also different drivers. The Dewesoft Power Analyzer makes it possible to do energy analysis considering all of these parameters already during the test drives. The first chart shows an example of the acceleration behavior of different test drivers on the same test-track (left) and the analysis in different driving situations. The acceleration behavior can influence the energy consumption of up to 10 %. The second chart shows the acceleration of the scooter at different driving situations. The green chart is the acceleration with full-charged battery, the blue one when the battery was nearly empty, the red one for uphill and the magenta one for downhill driving. The data logging capability of the Dewesoft Power Analyzer allows recording the complete charging process. Charging part 1: continuous charging with high power. Within 4 hours 80% of the battery is charged. Charging part 3: last charging part with low power. Within 14 hours battery is fully charged. Dewesoft supports EMC conformity tests of charging devices according to IEC 61000-3-2 and AND IEC 61851 standards. The Power Quality module automatically calculates all necessary parameters. 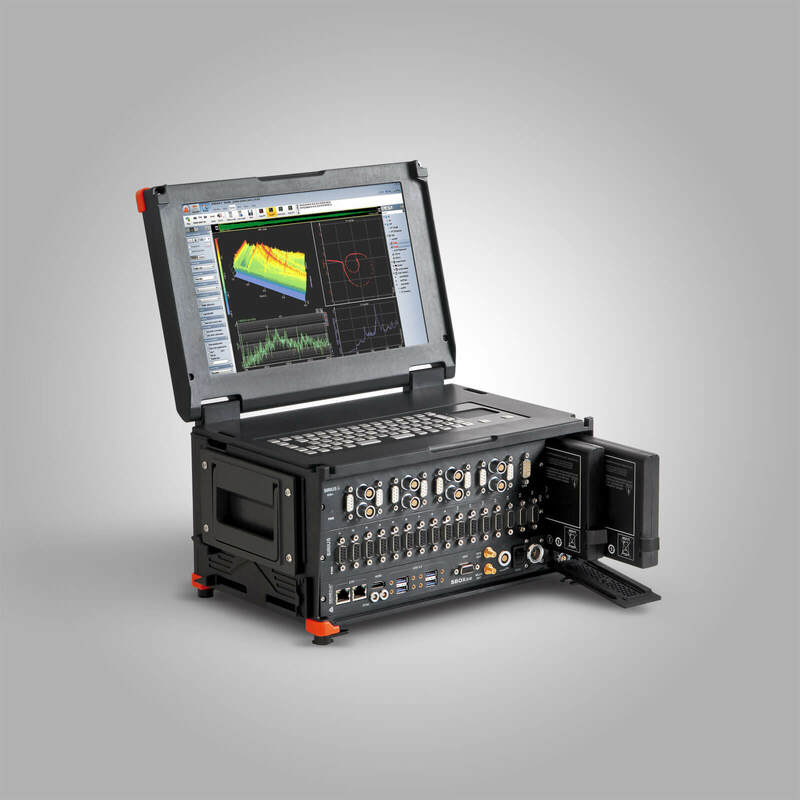 Instruments like the Harmonic FFT, the Harmonic table, Harmonic reference curve and the scope function ensure fast and reliable analysis.